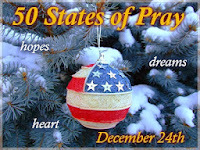 Short and sweet, but certainly not saccharin-filled, my post for the 50 States of Pray blog hop. Enjoy and go visit some others right here! 2013 will not make my top 10 best ever years, and probably would make the top 10 worst. But I am so thankful that I have had another year with everyone I love, and that through caring family and friends, both real life and virtual, I survived! I pray that 2014 is better, not just for me, but for everyone I know that is looking forward to the future. To everyone who believes in the true meaning of Christmas, hope you have a blessed and peaceful time; and if you don’t - just enjoy the parties! May 2014 be merry and bright! Merry Christmas from Texas. Hi, Suzanne! I hope that 2014 will be an AWESOME year for you. Merry Christmas! Have a peaceful and blessed Christmas, Suzanne. I pray that 2014 will skew your "good year curve" back towards the top. Have a Merry Christmas! I pray for a better 2014 for you too. Merry Christmas! Here's hoping 2014 is better for everyone!! I'm not sure 2013 will make my Top Ten, either, but it is what it is - now that it's over, right? I hope 2014 makes one of your top ten best years! Merry Christmas! Here's to the granting of your wishes. Merry Christmas! I've had years like that. Turns out, they were blessings in disguise. Merry Christmas. Oh, 2013 is so far my hardest year EVER. I can totally sympathize with what you're saying. I hope this year is better for you, too. I'll be praying for you, and I don't say that lightly. I will. Take care, and thanks for sharing your thoughts and prayers with us. I can tell that out of not exactly great year, next year will reinforce your resilience for life to get better. I have spent Christmas alone, yet I'm not alone. This is the power of the sharing, caring blogging community. When we help each other, we help ourselves. Hope you had a lovely Christmas, my friend. Hi Suzanne - another little Englander! Welcome and thanks for sharing our Christmas Eve Prayer Fest .. Here's to a happier 2014 - I think many of us will be working extra hard to make our 2014 year better for all concerned ... helping ourselves while helping others ..
Hope you Christmas was magical. Yes, 2013 wasn't great, but our positive vibes for 2014 will give us a boost to make it a good year for all. We have each other and as for me that is a VERY comforting thought! 2013 started out rough for us but it improved as it went. I hope it continues into 2014 and that the year is great for you. Hi, Suzanne - this is a wonderful post. Glad indeed for another year. There is much to be thankful for. Thank you for stopping by my blog. I wish you the happiest of new years! There is something refreshing about starting a new year isn't there? I hope this one is a blessed one for you. May you have a blessed 2014! Sorry it was a bummer year. That just means next year will be awesome, right? I'm also sorry that you had a bad year, but with your positive outlook, things are bound to shine brighter in 2014! Wishing you all the best in 2014, Suzanne! It can only get better then. I hope 2014 is your year! I usually reply individually, but it's Christmas and my little girl needs a cuddle! I'm counting on it Alex LOL! Hi Julie - I am 99% of the time a very positive person, just every now and then I succumb to the 1% - Normal service has already been resumed LOL! I love your honesty and lack of saccharine. I felt the same about 2012. Wonderful sentiments! Best of the holidays to you! Hope 2014 is better for you! Just saw above that you went to Midnight Mass - I wish our church would bring that back too! Here's hoping for a better 2014 for ya! Would be great to see you this year Sarah! Deniz - it really was lovely, think it's basically down to the priest, so hoping our new one will stay for a few years! 50 Shades of Pray Blog Hop!